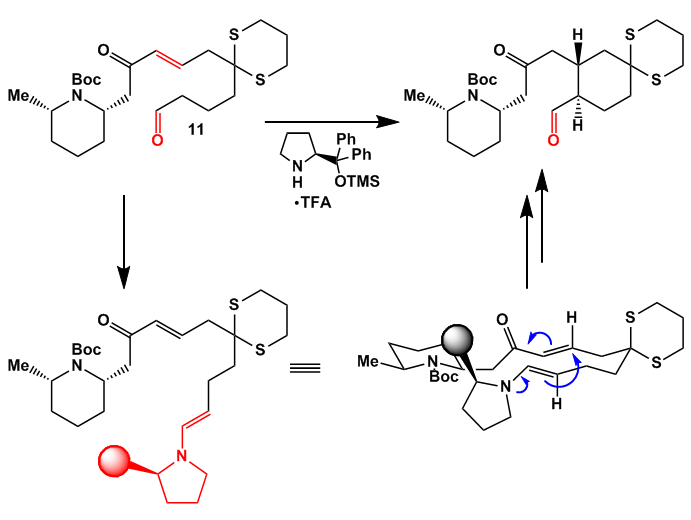 With this reagent a lot of bromonium ion induced cyclization reactions are possible which do not work well with the common reagents e.g. NBS or TBCO. 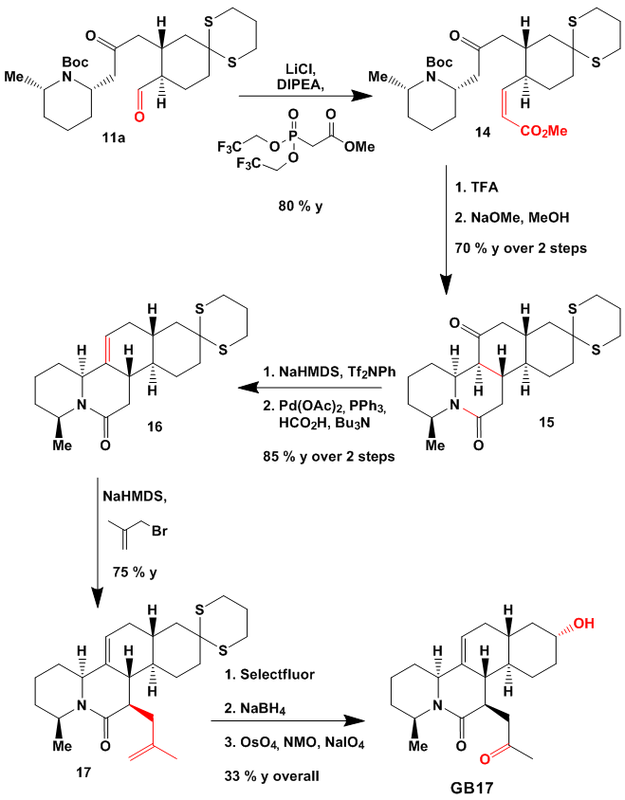 In a communication from 2009 the group used this reagent quite efficiently to produce fused cyclohexane systems. As can be seen from scheme 3 some quite interesting motifs can be produced in a highly selective and efficient way. Recently the group reported an extension of this methodology which prompted me to write this little review. 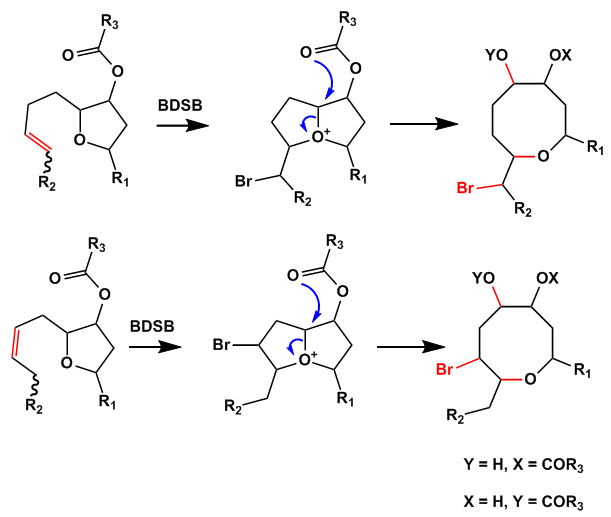 They used BDSB to convert tetrahydropyrans into oxocane ring systems through an interesting biomimetic rearrangement reaction. 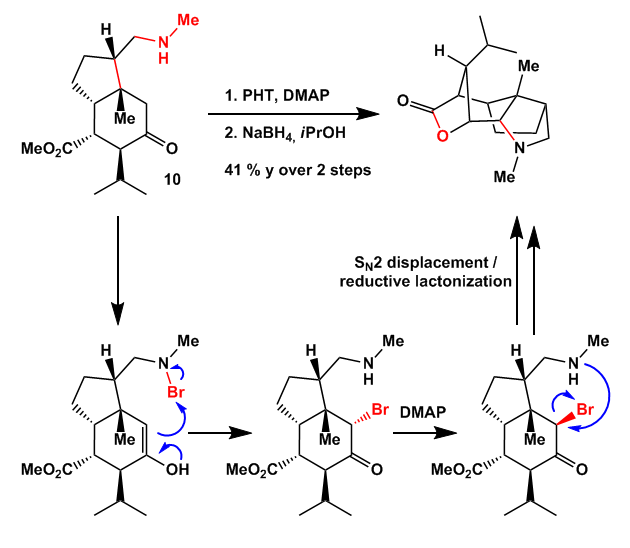 By exposing the substituted THP-rings to BDSB a bromonium ion induced cyclization occurred which opens the five membered ring to an eight membered one. 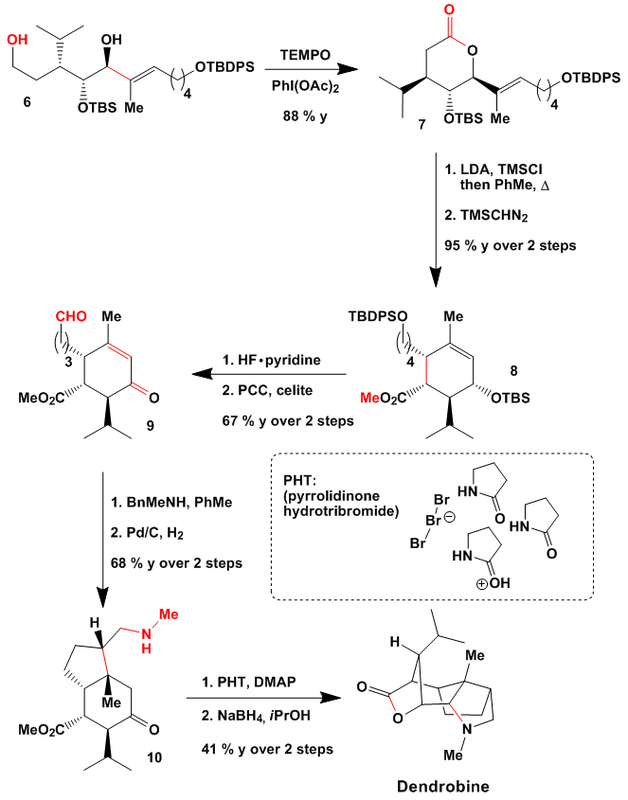 And all this in a stereoselective manner with high ee’s. 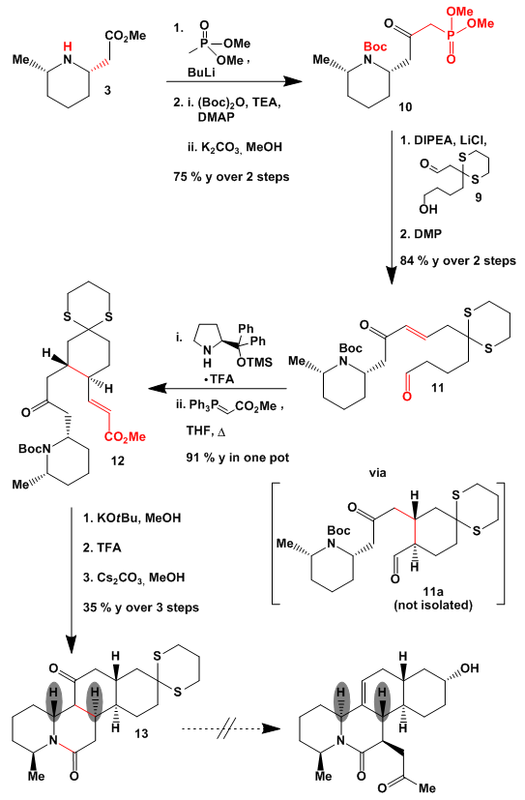 Following this approach some members of the lauroxocane group of natural products were produced. 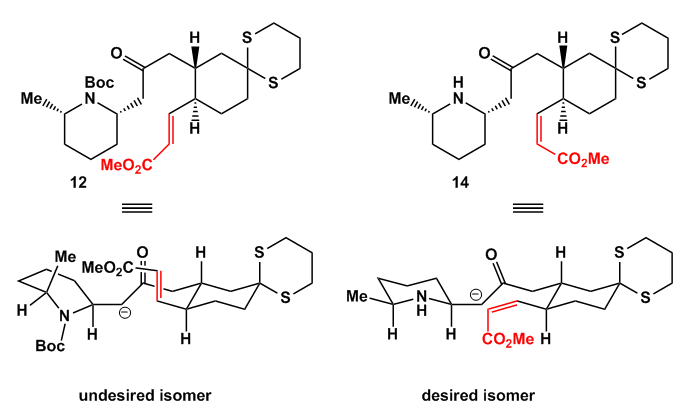 Depending on the tetrahydropyran used a lot of diastereomers can easily be synthesized. 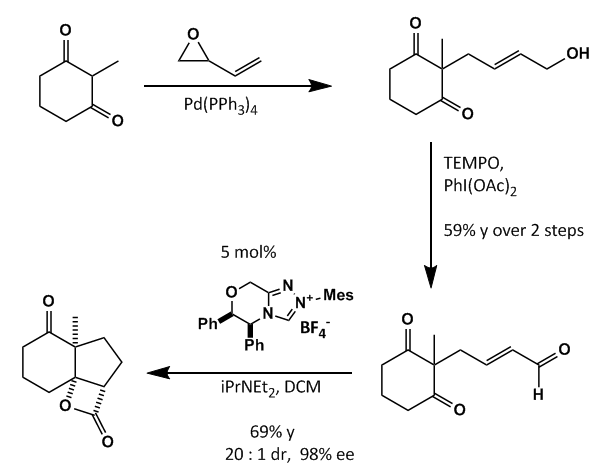 In a representative example the group started from pentenol and methoxypropene to produce via a Claisen rearrangement 5-octenone. 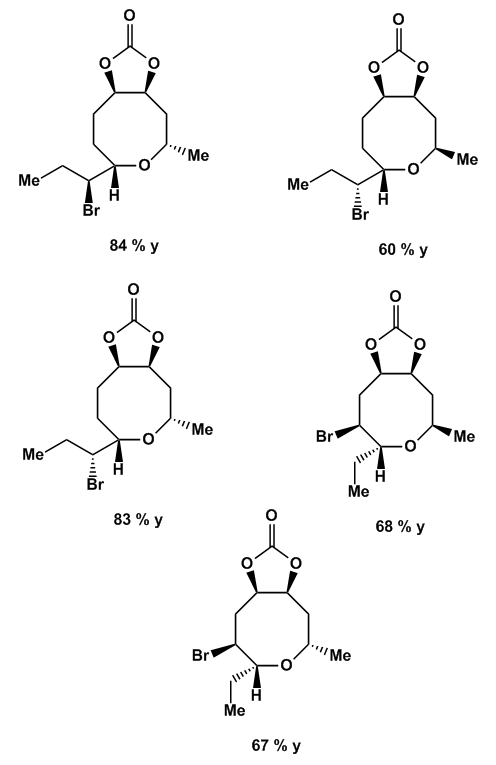 The second fragment derived from hexanal which was stereoselectively chlorinated using NCS and L-proline. 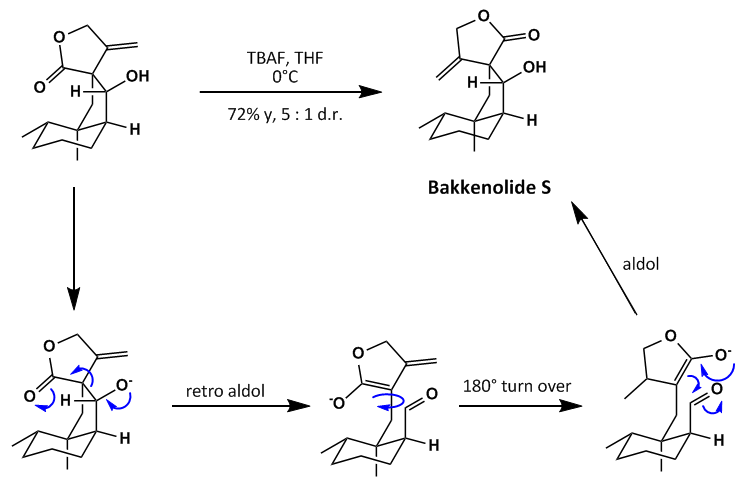 An aldol reaction combined both halves and the resulting aldol product was exposed to anti selective reduction conditions. 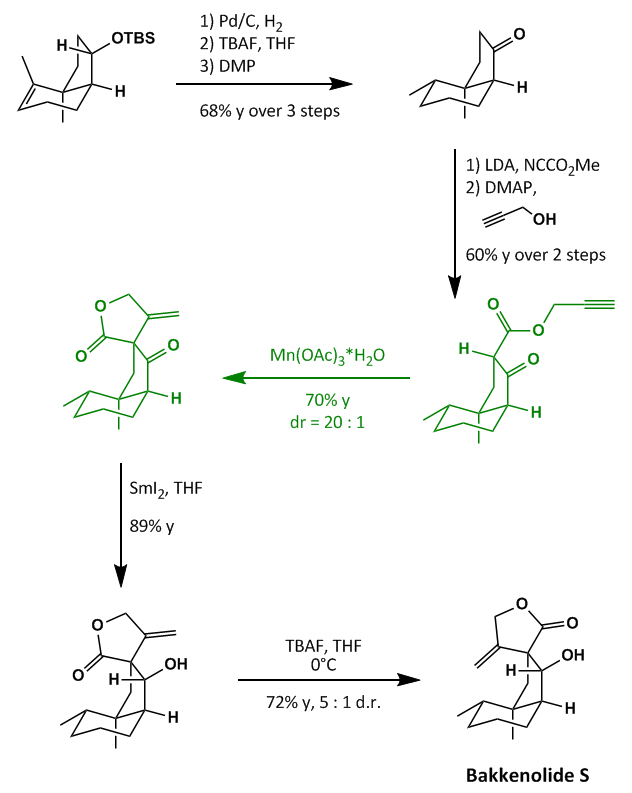 Cyclization to the tetrahydropyran was accomplished under high pressure in methanol. I think this is a very useful methodology to form medium sized rings otherwise not so easy to access. 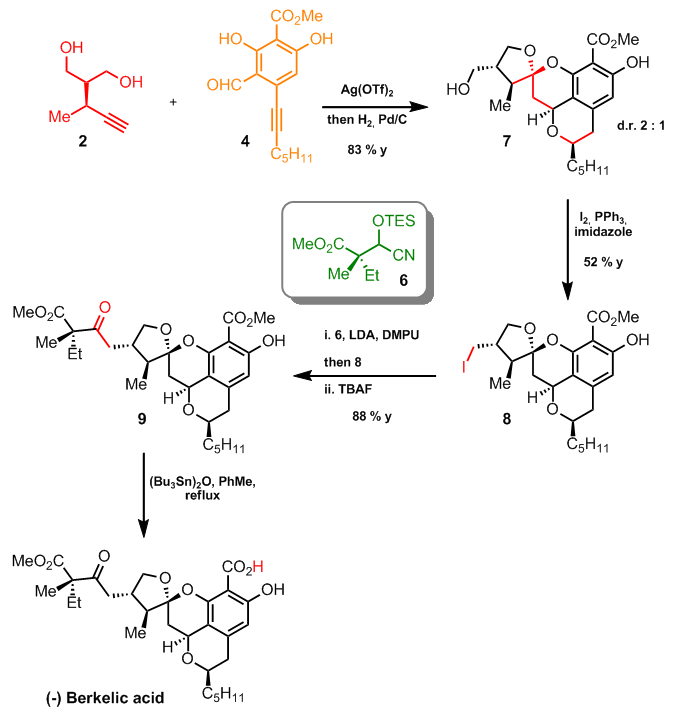 Because of the ease of preparing BDSB it will hopefully find more applications in literature and total synthesis. THX to Bobby for the helpful corrections. 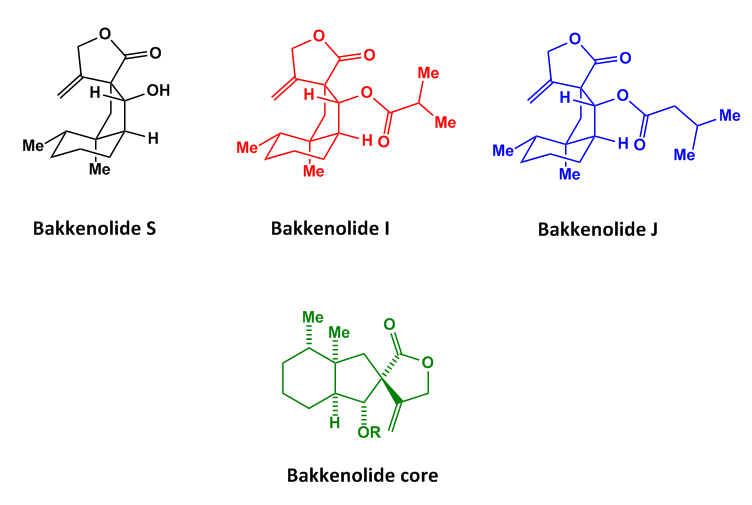 “The bakkanes are a large class of sesquiterpene natural products containing a characteristic cis-fused 6,5-bicyclic core”. They possess a wide variety of biological activity for example antifeedant effects, platelet aggregation inhibition and presumably some activity against various cancer cell lines. 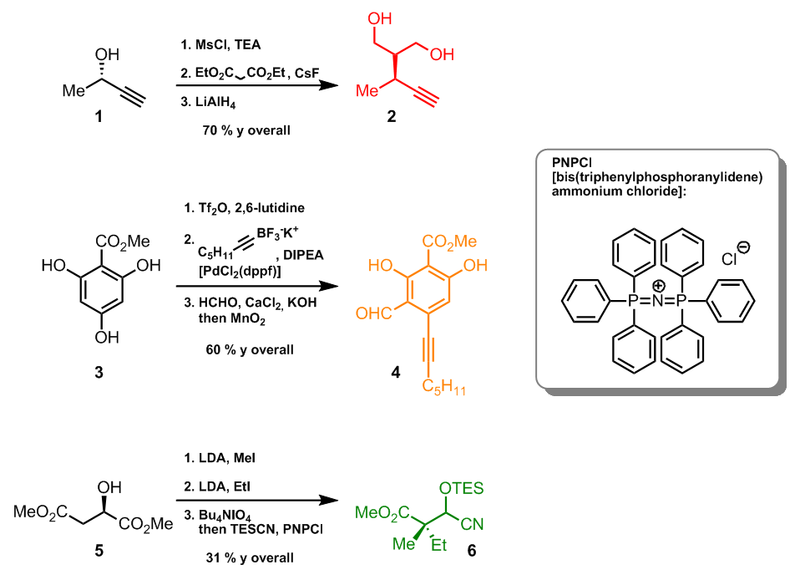 Some total syntheses were published to date but this one catched my eye because of the nice methodology presented here. 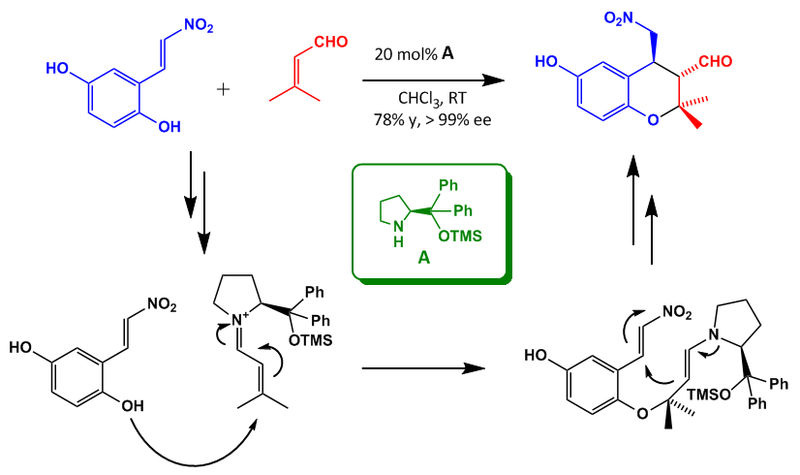 As you might know, NHC (N-heterocyclic carbene) catalyzed reactions can be used in analogy to nature’s TPP-catalyzed aldol reactions, e.g. 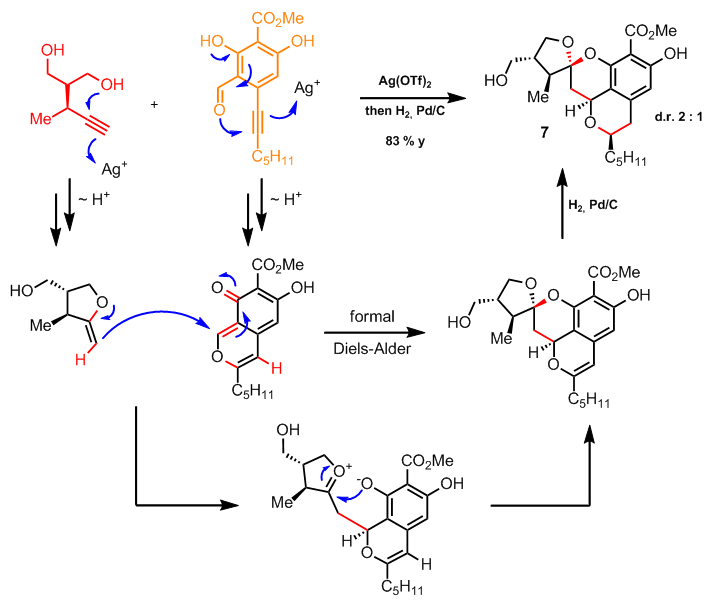 in the Strecker reaction. 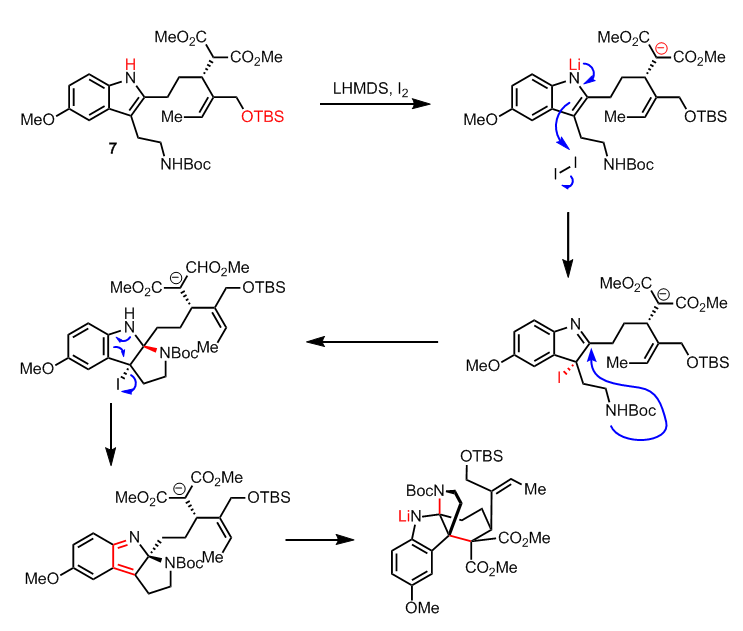 Further examples are the use of NHC’s as ligands in metathesis reactions, Suzuki- and Buchwald-cross couplings or, as presented here, in an enantioselective synthesis of β-lactones. As you can see with the core of Bakkenolide S in hand the remaining two are easily made. 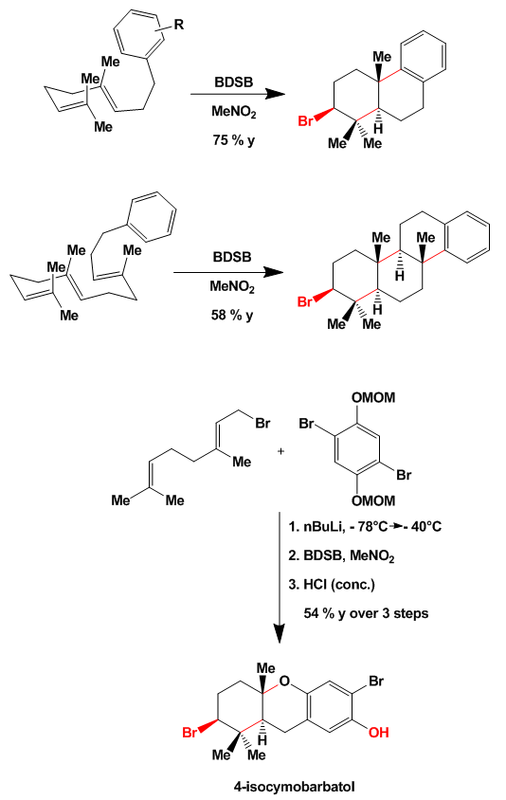 The synthesis starts off with a Tsuji-Trost reaction giving them the allylic alcohol which was oxidized with BAIB in the presence of TEMPO to the unsatured aldehyde (why didn’t they use manganese dioxide?). 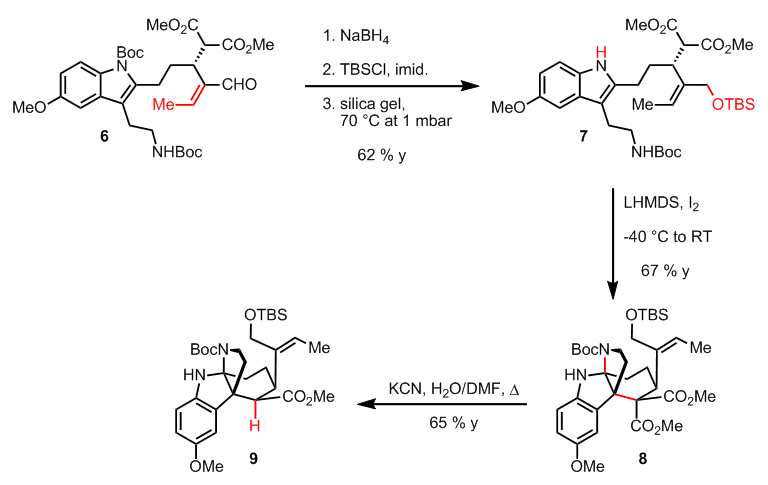 This was cyclised to the β-lactone employing the group’s own chemistry with a good yield and excellent enantio- and diastereoselectivity. With the key intermediate in hand the group removed the lactone in the presence of silica gel to give the olefin and carbon dioxide. 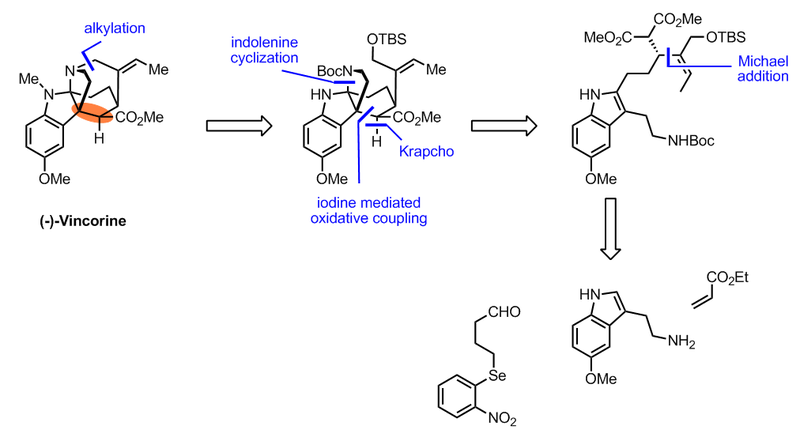 Dioxolane formation was followed by stereoselective boronation/oxidation to the alcohol followed by deprotection of the ketone and TBS ether formation. 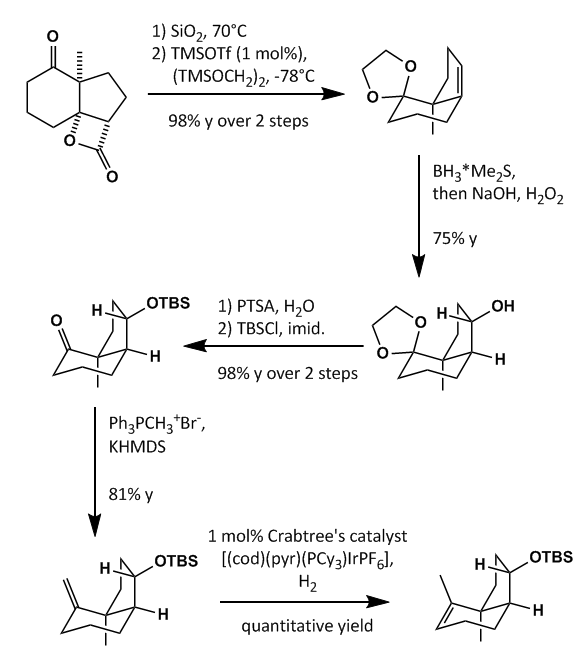 Wittig reaction to the terminal olefin and isomerization with Crabtree’s catalyst gave the trisubstituted internal alkene. 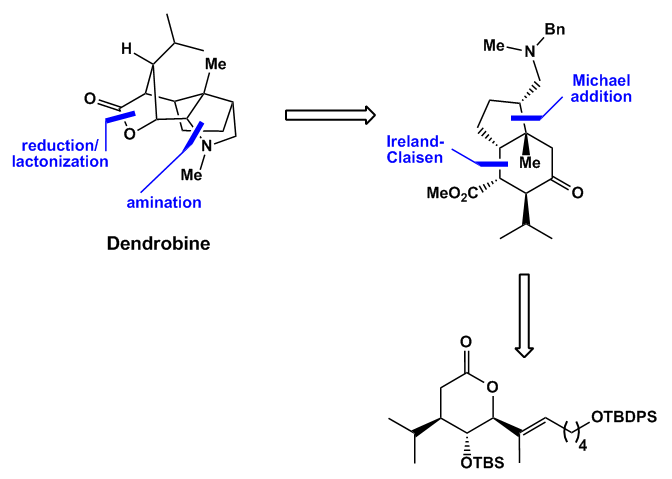 Reduction of the alkene, de-silylation and DMP-oxidation then furnished the ketone shown. 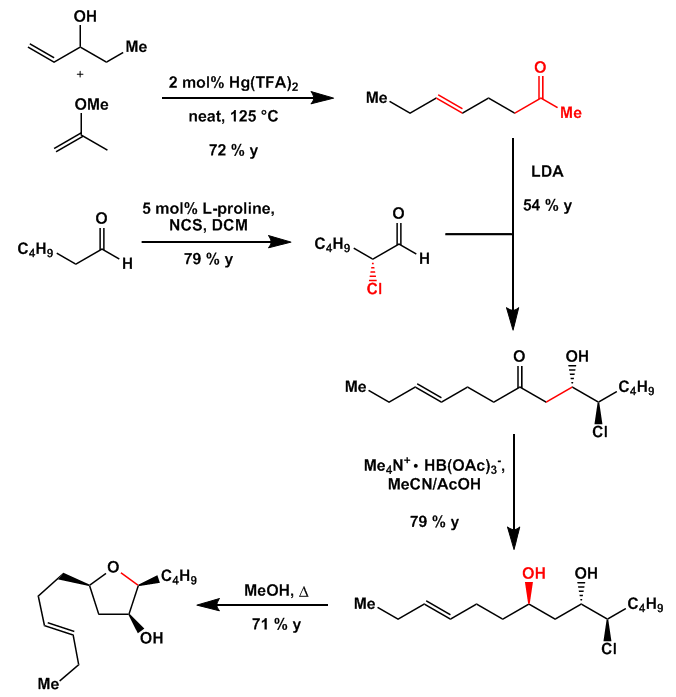 Deprotonation was accomplished with LDA, the resulting enol reacted with Mander’s reagent and the methyl ester transesterified with propargyl alcohol. 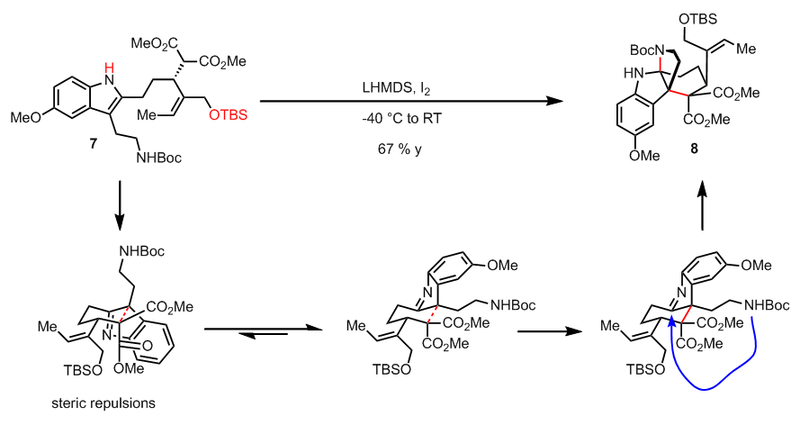 The prepended isomerization of the terminal olefin proved to be necessary because direct reduction under various conditions didn’t produce the expected product. The following step presents again a nice methodology which I will present to you separately. 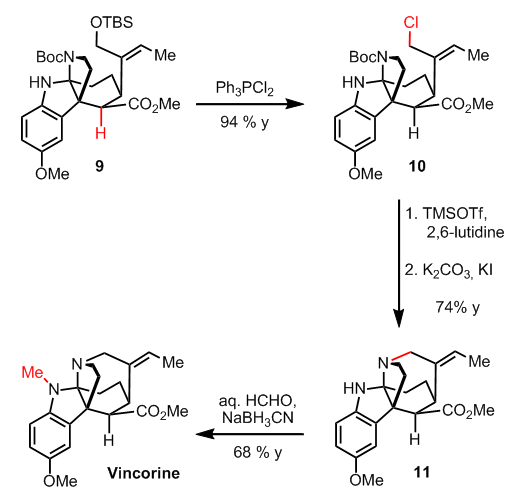 Originally the group planned to produce the δ-lactone via a Conia-ene reaction (http://www.organic-chemistry.org/namedreactions/conia-ene-reaction.shtm) but this attempt was unsuccessful. 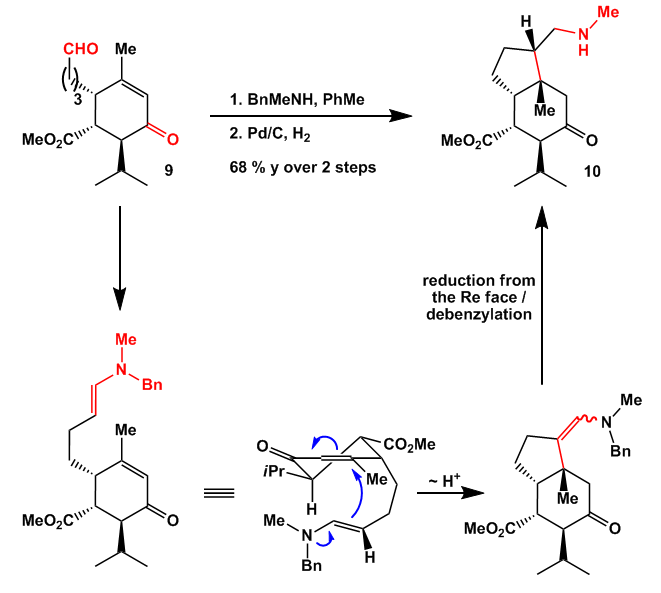 Nevertheless by reacting the propargyl ester with Mn3+ the lactone was formed in very good yield with excellent diastereoselectivity. 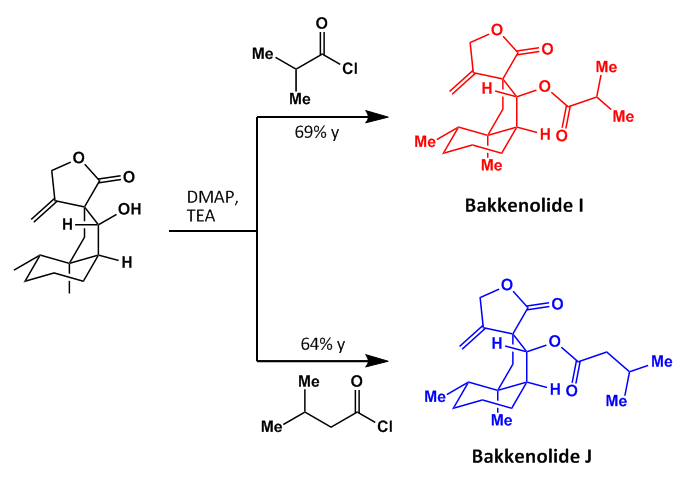 Reduction of the ketone and subsequent isomerization of the lactone then produced Bakkenolide S.
First a SET oxidation by manganese to give the strongly stabilized radical which reacts after rotation of the ester group with the alkyne moiety to give the 5-exo-dig radical. 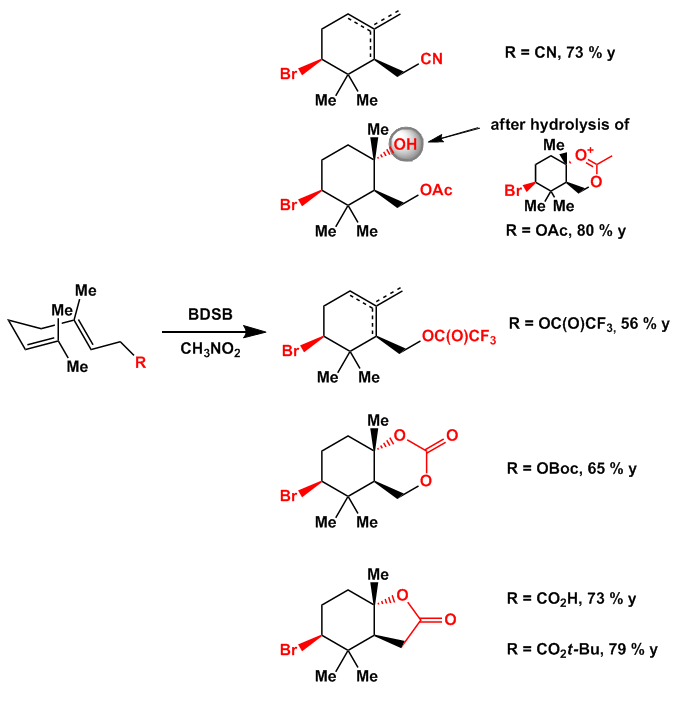 To the end, ester formation with the corresponding acid chloride gave Bakkenolide I and J. Overall a nice synthesis in which a lot of interesting methodology was employed. 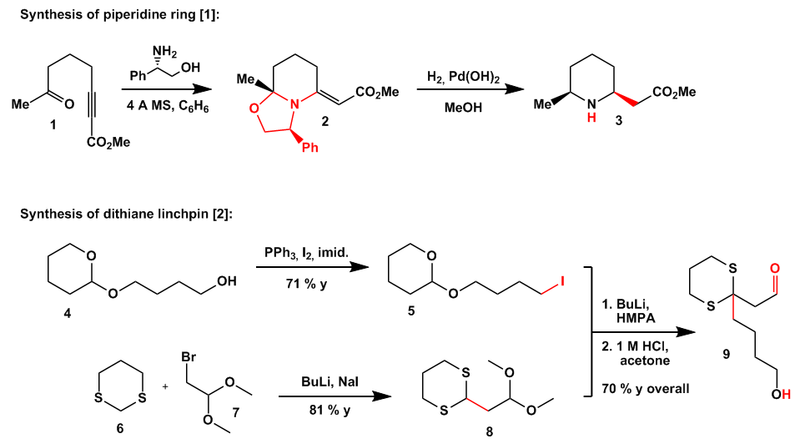 If you’re interested in further reactions catalyzed by this NHC’s have a look in the references. 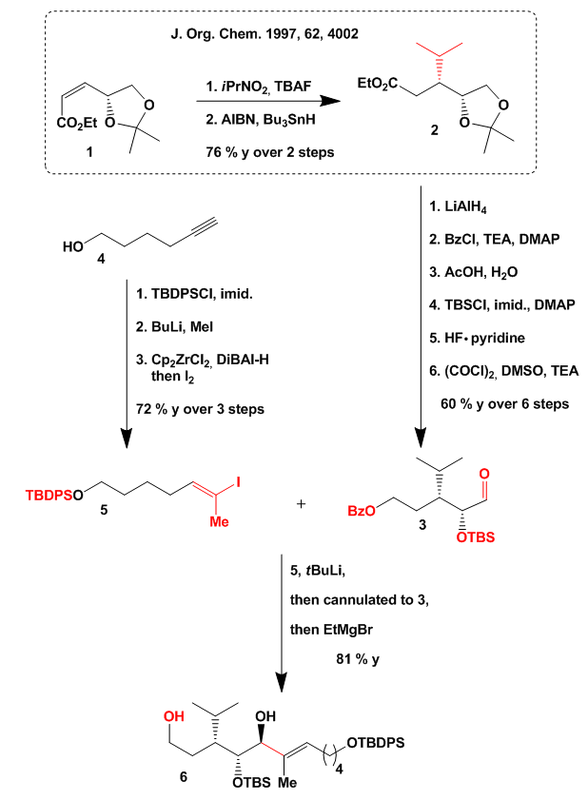 The TBAF acts as a base and deprotonates the alcohol. 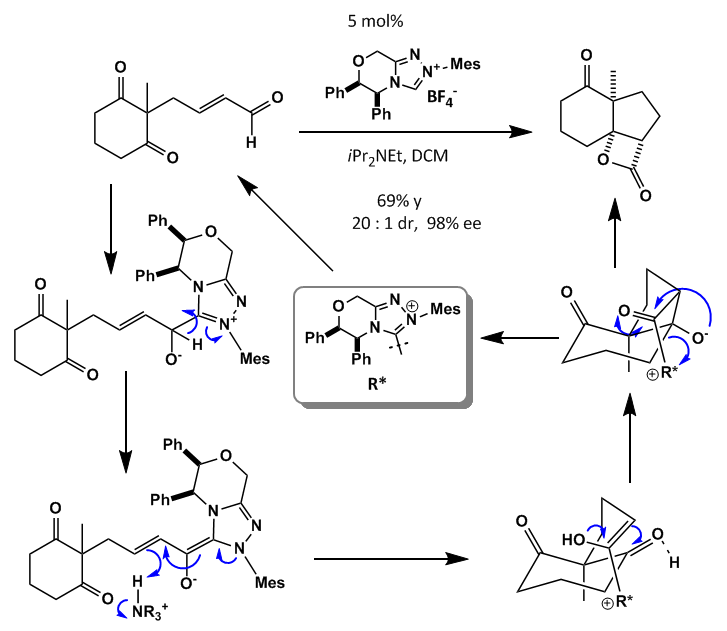 This undergoes a retro aldol reaction followed by bond rotation of the latone and reverse aldol reaction to give the final product. 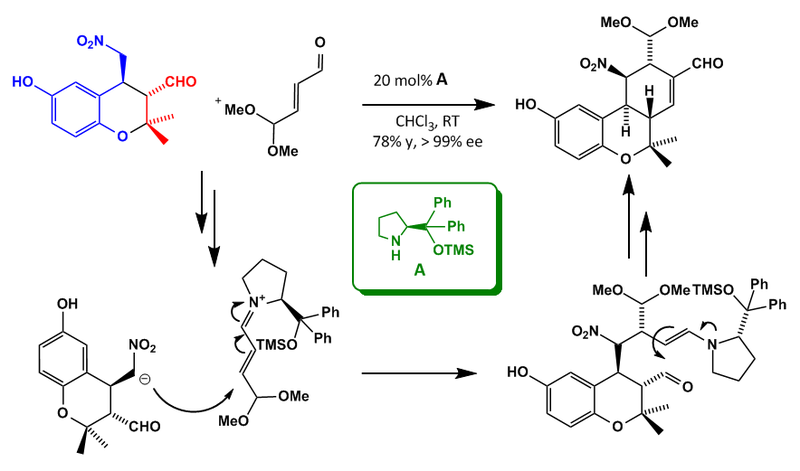 This time some organocatalysis already published last year by a group based in Taiwan. 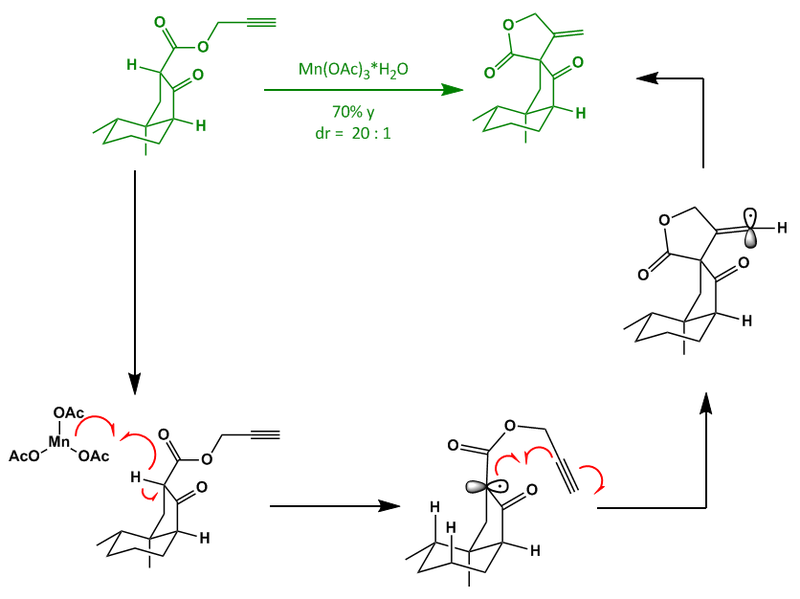 Though not a spectacular paper I liked the first few steps and so reviewed it. 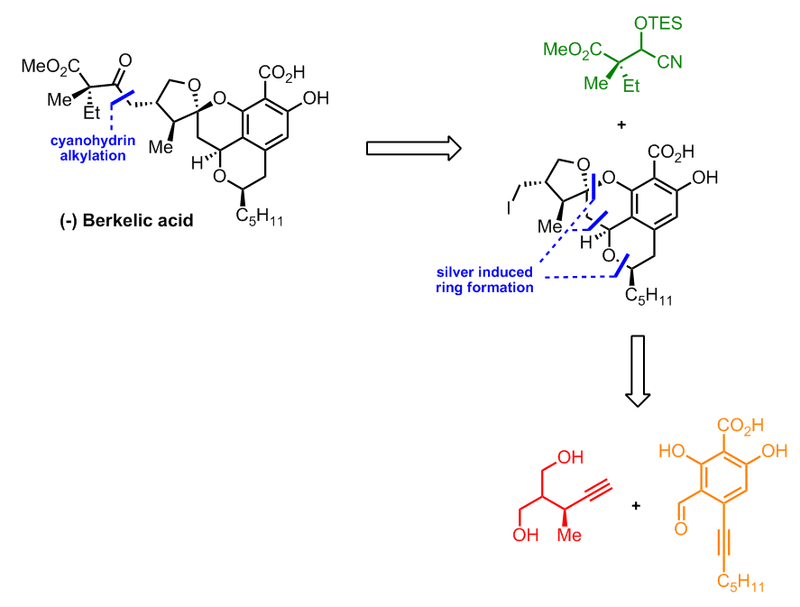 Conicol belongs to the class of meroterpenoids which were isolated from higher plants and recently from marine organisms. And as usually with these marine stuff it exhibits some cytotoxic effects against human cancer cells . 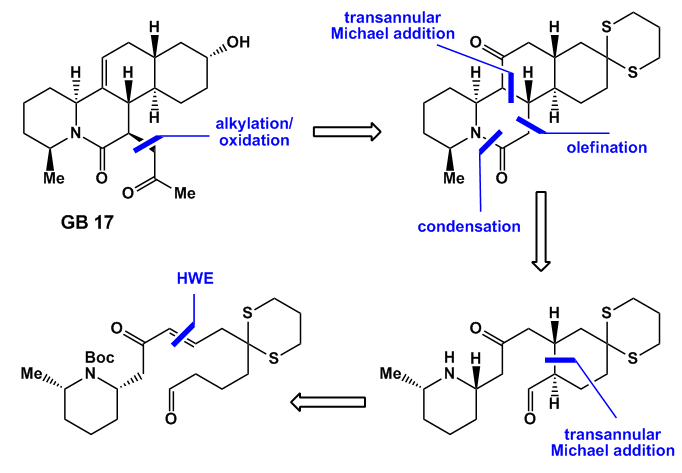 The key steps of the synthesis are a TMS-prolinol catalyzed enantioselective alkylation/Michael addition reaction followed by another Michael addition/aldol condensation to build the backbone of the whole molecule in almost 2 steps. Additionally these two single pot sequences can be combined to one protocol giving the product in 55% yield with > 99% ee. 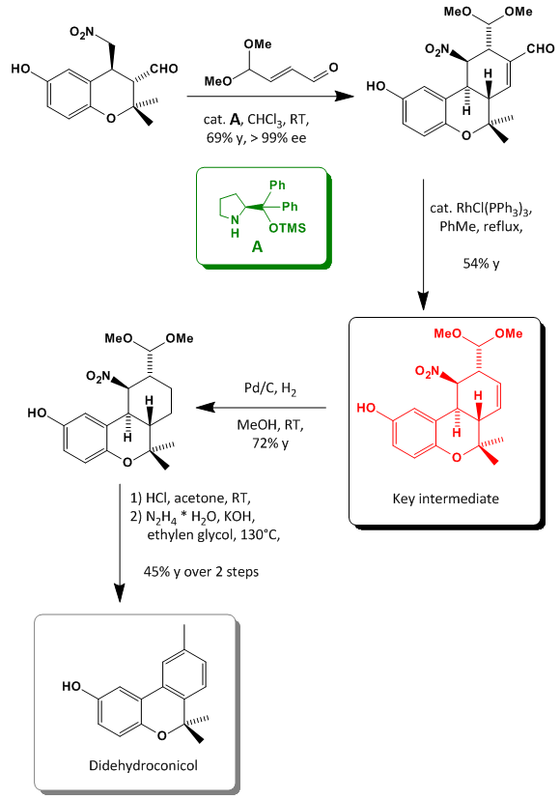 A decarbonylation reaction with Wilkinson catalyst was followed by double bond reduction with palladium on charcoal. Interestingly the nitro function is stable under these conditions. 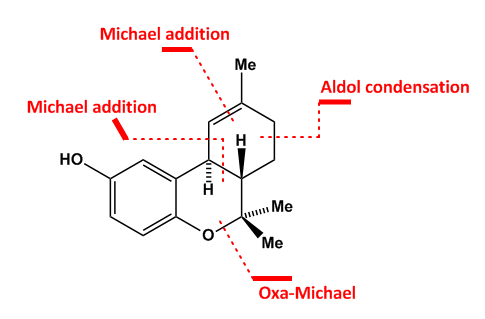 Next the dimethylacetal was cleaved with hydrochloric acid, which results in elimination of the nitro function too, and an old school Wolff Kishner reduction gave Didehydroconicol. Going on from the key intermediate the acetal was cleaved under milder conditions without causing elimination of the nitro function. 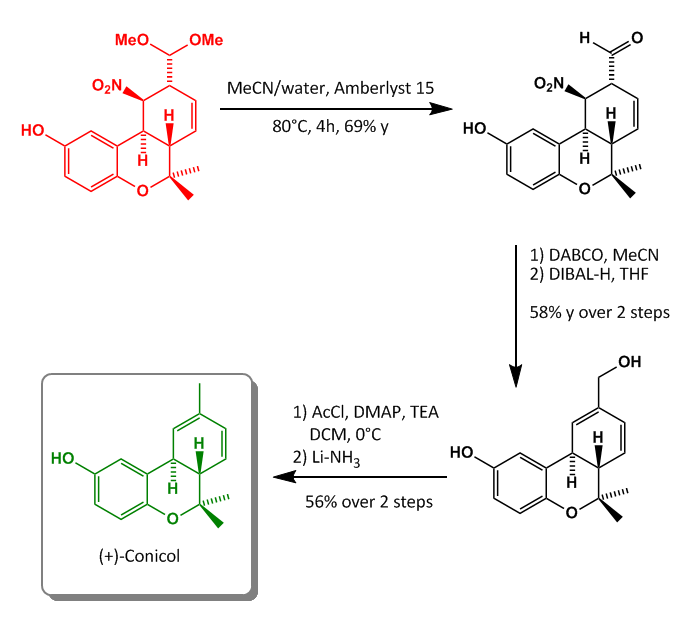 This was done with DABCO, the aldehyde reduced, acetylated and eliminated under Birch conditions to give (+)-Conicol in 5% overall yield over 9 steps in the longest linear sequence. I didn’t manage to publish this in january, sorry for that, but I’m just on the next paper so maybe I finish 3 reviews in February to keep my average of 2 reviews per month.